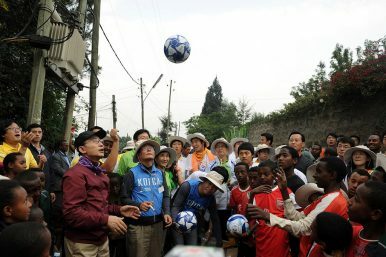 Former President Lee Myung-bak visits Kebena, a district in the Ethiopian capital, to do volunteer work (July 9, 2011). South Korea is an emerging player in Africa with hopes of benefitting their national interests through strategic partnerships. South Korea’s Saemaul Undong (New Town Movement) initiative helped boost economic expansion throughout the country’s rural villages and towns in the 1970s. The Movement promoted a system of self-reliance and cooperation with one’s community, effectively weaning the population off of foreign aid and modernizing the countryside through four key steps. Step one – establish community leaders and gather funding; step two – host meetings in the community to get others involved; step three – modernize homes and create cultural facilities; step four – build city halls and partner with neighboring towns. Over the past decade, grants and projects using the Saemaul Undong model are being used as a soft power export by South Korea in hopes of forming key partnerships in Africa. The Saemaul Undong initiative is credited to imprisoned former President Park Geun-hye’s father, President Park Chung-hee, and it aided South Korea in becoming the first and only country to transition from an aid recipient to a donor. Park Chung-hee formed the idea for this model in August 1969 after passing by farmers and countryside residents of Sindo Village working on community improvement initiatives in Cheongdo, South Korea. Eight months later, Park instructed governors around the country to replicate the Sindo Village model, which is now known as the Saemaul Undong. I lived and worked in Cheongdo for three years and noticed that every school in the area teaches their students about Cheongdo’s influence regarding the Saemaul Undong. While the movement’s success is certainly recognized regionally, the past decade also revealed international interest in replicating the model in developing countries. Seoul is taking notice of the interest and is exporting the Saemaul Undong model to countries around the world in the form of grants that provide replica projects in 21 different countries in Africa. Saemaul Undong grants are being used by Seoul to gain increased access to key resources and promote South Korean businesses. South Korea is an emerging player in Africa with hopes of benefitting their national interests through strategic partnerships. According to a report from Chatham House, South Korea’s engagement in sub-Saharan Africa is driven by three contributing factors: pursuit of food and energy security, establishment of new markets for South Korea’s manufactured goods, and enhancement of its credentials as a global power. Saemaul Undong grants and projects are helping Seoul to address these areas. South Korea, being one of the most energy dependent countries in the world, imports the vast majority of its energy sources. As of 2015, South Korea received more than 83 percent of its crude oil imports from the Middle East, leaving the country vulnerable to the region’s instability. By engaging more in Africa, and securing natural resources such as oil and gas, Seoul is hedging against risks via Middle East turmoil and uncertainty. For example, imports from Africa to South Korea increased from $383 million in 1990 to $8 billion in 2014 with the majority of imports being petroleum and natural gas. This trend indicates South Korea’s awareness, and shows they are trying to counter their energy vulnerabilities. More than just oil and gas, South Korea is also interested in food security due to its position as a massive food importer. This helps explain South Korea’s interest in countries like Rwanda, where four in five working adults are farmers. In addition, Seoul typically uses Saemaul Undong grants and other official development assistance (ODA) as tools to further the interests of South Korea’s companies with the intention of securing favorable access to resources and infrastructure projects. For example, in 2013, South Korean company Korea Telecom (KT) struck a deal with the Rwandan government to provide high-speed 4G internet to nearly the entire population within a matter of three years, making Rwanda the first African country to have such a comprehensive high-speed internet capability. South Korea also provided $11 million to Rwanda for a rural community development project in 2015 and invited Rwandan government officials to attend the Global Saemaul Leadership Forum in South Korea. The goal of the forum was to educate officials from developing countries about the core principles of the Saemaul Undong, including diligence, self-help, and cooperation. Through these projects, South Korea has positioned itself as a strong partner with one of the most technologically advanced countries in Africa and hopes to use Rwanda as a springboard to other tech-related infrastructure projects on the continent. Additionally, Seoul has been successful in creating access to crucial resources needed back home. Notwithstanding successes at kindling new friendships, South Korea has experienced several regional setbacks. In 2008, the government of Madagascar awarded a 99-year land lease to Daewoo Logistics, a South Korean chaebol, for 1.3 million hectares. In return, Daewoo was to provide substantial development of the island’s infrastructure, as well as create 70,000 jobs. The deal was controversial as Daewoo was accused of disrespecting Malagasy culture by not consulting with local people over a process that would have affected a large portion of the population. In the end, the president of Madagascar was ousted, the deal with Daewoo was nullified, and South Korea’s reputation took a large hit as the Malagasy people viewed Seoul complacent in the “land grab” under the guise of Saemaul Undong projects. Following the Daewoo incident, South Korea provided a series of additional Saemaul Undong grants to Madagascar in hopes of rebuilding their reputation in the area. Another regional setback occurred in 2013 when South Korea received an EU “yellow card” over alleged illegal, unreported, and unregulated (IUU) fishing practices in sub-Saharan Africa. Fishing is a crucial industry for many coastal communities in Africa, but some governments lack the resources to counter IUU fishing and are suffering tremendous economic losses as a result. South Korean vessels in particular have been identified as the main aggressors by fishing authorities in Liberia, Ghana, and Guinea. The South Korean government has been more aggressive in countering illegal fishing in recent years and eventually cleared its yellow card from the EU following reforms. However, a stigma still exists in parts of Africa and South Korea may face some difficulties in rebuilding its reputation. Fortunately for Seoul, Saemaul Undong projects and grants have the potential to mend past misdeeds for countries looking for development assistance. Despite setbacks, the injection of South Korea’s Saemaul Undong grants and projects into developing countries helps strengthen the country’s reputation in Africa. By continuing to export the Saemaul Undong model via grants and replica projects throughout developing Africa, South Korea should be able to expand food and energy security, establish new markets for its businesses, and enhance its status as a global power. Martin Seitz is a returned David L. Boren Fellow (South Korea 2015-2016) and is currently an Emergency Management Specialist at the Federal Emergency Management Agency (FEMA) within the Department of Homeland Security (DHS). The opinions expressed in this article are the author’s own and do not necessarily represent the views of FEMA, DHS, or the United States government. Seoul rides the "Korean Wave" to promote its soft power far beyond East Asia.